Apple is fond of saying that its Macs "just work." That's a relative term, of course. Macs do indeed deliver the smoothest integration of software, hardware and services in the computer business, with a record for reliability that most big makers of Windows PCs can't touch. But these days, it's Apple's iPhone and iPad that set the standard for seamless simplicity. Compared with them, Macs are mere personal computers, complicated by features that aren't absolutely necessary, parts that are prone to failure and interfaces that aren't instantly comprehensible to clueless newbies. That's one way of looking at things. And judging from last week's press conference at Apple headquarters in Cupertino, Calif., it's the direction that the company's own thinking is going. M.C. Steve Jobs explained that the event's title, "Back to the Mac," referred to borrowing good ideas from the iPhone and iPad and taking them to Macs. Then he and other execs outlined a slate of new hardware, software and services that seem intended to make the nearly 27-year-old Mac platform feel less like yesterday's fussy personal computer and more like tomorrow's worry-free digital appliance. The first hints of this makeover arrive in the latest MacBook Air notebooks. Even svelter than the first Air that debuted in January 2008, they boast beefier specs, fewer design compromises made in the quest for razor thinness and a much lower starting price of $999. Apple says that they "define the next generation of MacBooks," prepping its customers for a day  probably not far off  when all of its laptops will resemble the sleek Airs more than they do the feature-laden, performance-oriented MacBook Pro line. The downside of flash is that you get far fewer gigabytes for your dough than with a hard drive: the $999 Air's 64 GB of storage offers one-quarter of the space provided by the low-end white MacBook that sells for the same price. On every other front, though, flash is a major upgrade from the spinning platters of a hard drive. It runs faster, conserves space and battery juice, and is far less likely to die and take your precious data with it. I've been spending time with the smaller of the two new Airs, a 2.3-lb. version with a low-profile, wide-screen, high-resolution 11.6-in. display. It's not my personal dream machine in every respect. I missed having a built-in slot for the SD cards my digital-camera uses, and the battery life (an honest five hours) is acceptable but not exceptional. The larger Air, which starts at $1299, sports a 13.3-in. screen and weighs 2.9 lb., might be more my style  it has an SD slot and a seven-hour battery. Overall, though, the 11.6-incher's iPad-like minimalism make it painlessly portable in a way that most portable computers aren't. A friend who spotted me using it at a conference commented that it looked like I was typing on a piece of folded sheet metal. And when I returned to my trusty 4.5-lb. MacBook Pro after a few days, I felt like someone had deviously replaced it with a boat anchor. The new Airs may be Apple's most appliance-like hardware to date, but they run the same operating system as their predecessors, OS X 10.6 Snow Leopard. 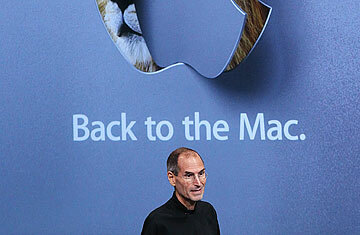 At last week's event, Apple also provided the first sneak peek at Snow Leopard's successor, code-named Lion and due to arrive in the summer of 2011. Oh, and then there's the new Mac feature that's destined to be simultaneously wildly popular and deeply controversial: within the next 60 days, OS X will get its own App Store. As with the iPad/iPhone version, the store will turn downloading and installation of software into a one-step process, let users update all their apps with a single click and permit the use of a program on multiple Macs for one price. Apple will decide which applications get in  the list of types it won't approve ranges from those which tamper with the OS X interface to "mean-spirited" ones  and will take a 30% cut as its distribution fee. Unlike iPhones and iPads, Macs will still run any program you install, from any source you choose. Even so, the introduction of an official collection of apps is bound to impact the ecosystem in ways that are tough to predict. Will the App Store's economies of scale drive prices for apps that would have once cost real money down to 99 cents or even nothing? Are big-name companies such as Adobe, Intuit and Microsoft going to make their wares available? Will developers self-censor to avoid the wrath of Cupertino? We'll see, starting soon. More than any other major tech company, Apple pursues its visions even in the face of uncertainty, criticism and second-guessing. The moves it's making will be subject to plenty of all of the above. Ultimately, though, the company does answer to a higher authority: the consumers who buy its products. They'll vote with their pocketbooks on whether the next wave of Mac hardware, software and services "just work." And if they give these changes a thumbs-up, you can bet that the appliance-ification of Apple's computers  and maybe personal computers, period  is just beginning. McCracken blogs about personal technology at Technologizer, which he founded in 2008 after nearly two decades as a tech journalist. His column appears every Tuesday on TIME.com. See photos of the unveiling of the iPad. Watch TIME's video "Are the New iPods and Apple TV Worth It?"